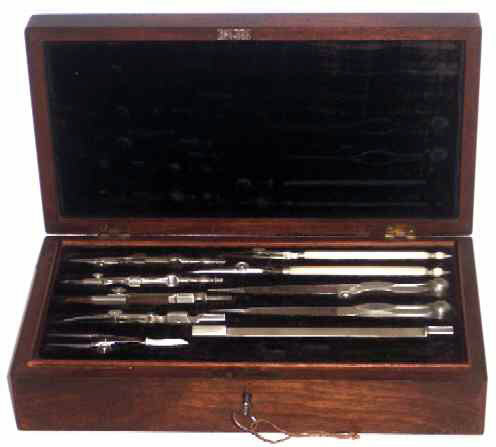 This very quality Drafting Set was "Top of the Line" when produced . . . constructed of "white brass" or "nickle silver". The machining is superb . . . both in quality and artistry. The case is finely crafted of Flame Grain Mahogany . . . no veneer here! * Still has the original key and it works! The box measures 9-1/2" long x 5-1/2" wide x 2-1/4" high and is in very fine condition.